Bill de Blasio talks ferries. 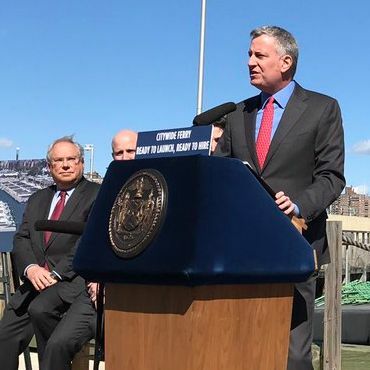 A clear, springlike Wednesday offered a nice backdrop for Mayor Bill de Blasio as he announced details about a new citywide ferry service that will start chugging this summer. A ferry ride will cost $2.75, the same price as a subway ride, but with that classic East River stench. The boats will operate from 6:30 a.m. to 10 p.m. daily. There’s no set date for the official summer launch; de Blasio said to expect an update next month. But Hornblower, which has a pretty unassailable ferry-company name and is operating the service, has started hiring 200 people to fill jobs at Brooklyn Navy Yard, where the new 56,000-square-foot facility is being built. Right now, the boats are apparently being battle-tested in the Gulf of Mexico before they arrive in city waters. Mayor de Blasio said about 500,000 people live within the ferry routes, and the city will add a free shuttle service to Brooklyn Navy Yard to help people access that terminal. Right now, the city is predicting about 4.6 million trips annually. The estimated cost of this endeavor, as reported last year, is about $325 million over a six-year period. The city is spending about $55 million to construct the ferry stops and make other infrastructure upgrades, and about $30 million per year will go to subsidizing the cost ($6.60 per rider) of a ticket to keep it on par with a MetroCard swipe. And yes, there will be booze on board.